Our second day in Yellowstone started with me calling Xanterra. Remember when I told you reservations for hotels in Yellowstone need to be made really far in advance? But there is the possibility to snag a room because of a last minute cancellation. Well, that happened to us in the best way and I truly was the HAPPY travel bug! There was one room that opened up at the Yellowstone hotel of my dreams…The Old Faithful Inn! I had wanted to stay there since I saw it as a child on my first trip to Yellowstone. In fact, I was so excited and felt so blessed to get the room that I called my Mom and told her about it. She was excited for me too! 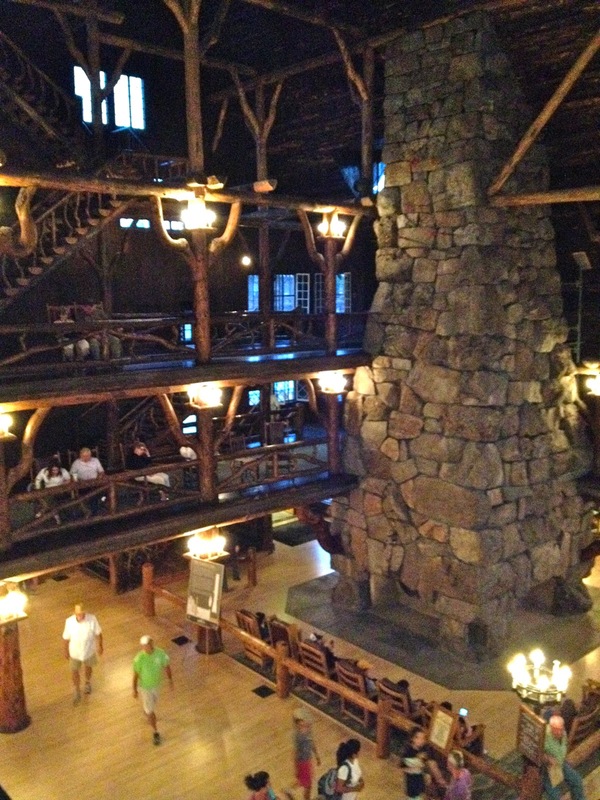 Why do I like the Old Faithful Inn so much? I don’t really know, but I think it is because I love log cabins and this is a log cabin on steroids. Also, I am a history buff and it is a National Historic Landmark built in 1903. Plus, when you are little and have a dream about doing something, it feels so cool to finally get to do it. The deck above extends out over the entrance of the hotel. I love the way it looks like lincoln logs! Did you ever play with those as a child? My son did. 🙂 The best thing about the deck is the view of Old Faithful. (see below) That is it there in the distance steaming away. Imagine sitting out there with a drink watching the world’s most faithful geyser. 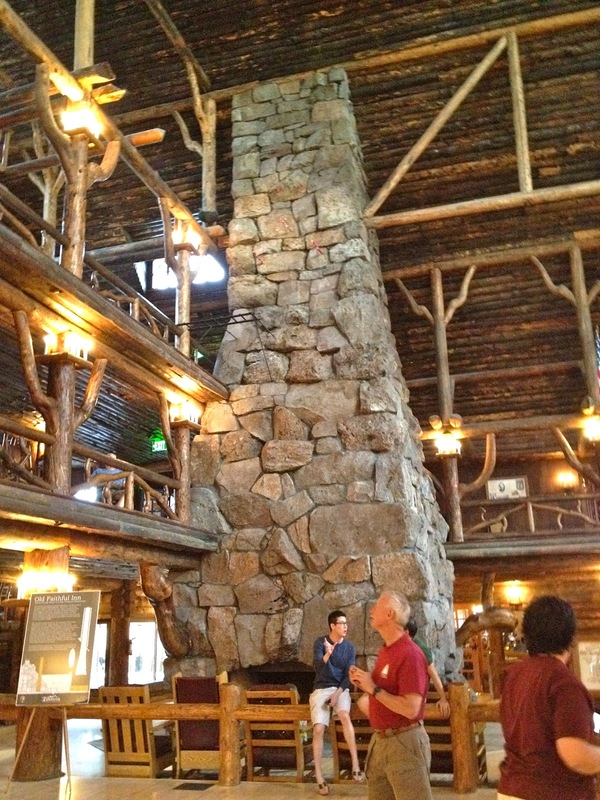 The lobby of the hotel has 65 foot ceilings, a massive rock fireplace and railings made of contorted lodgepole pine. It is very dark inside, but that just adds to the ambiance. 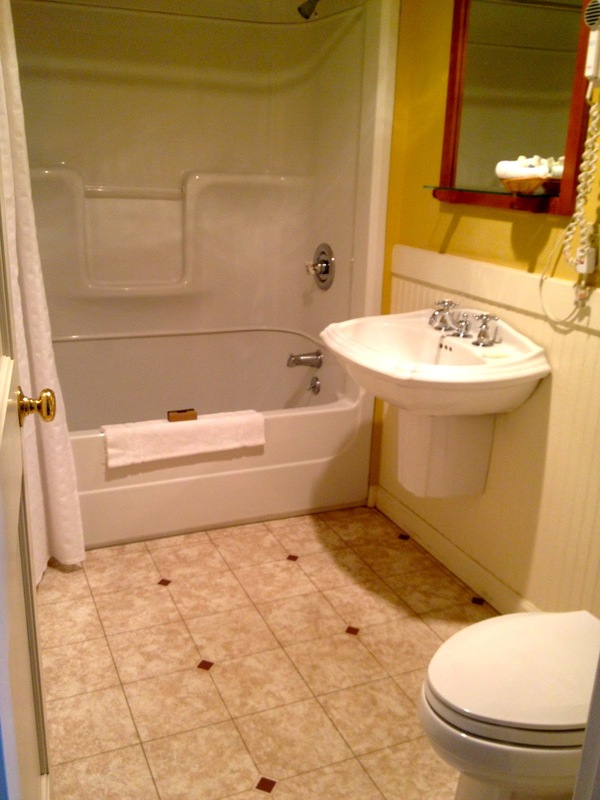 While it would be cool to stay in this section because of the history, I did find out that the bathrooms are separate from the hotel room. So in the middle of the night you would have to go out in the hall to go into the bathroom. Not sure I’m up for that. Our rooms were primitive enough for me. As with all the hotel rooms in Yellowstone, there are no televisions, radios, internet service and the big one…AIR CONDITIONING! This was particularly difficult for my son. Wish I had a picture of him after he discovered the little desk fan in the closet. But I agree with him, it was hot. I ended up opening the window, sitting the fan on a chair in front of it to pull in the colder outside air. I didn’t miss any of the other stuff like tv or internet. But lets face it, you aren’t staying here for the room itself. It is for the experience of the rest of the hotel. They did have cute little bear soap. I like fun little details like that. Despite the simplicity of the actual room and bathroom, I still think the Old Faithful Inn is a fantastic place to stay once inside Yellowstone National Park. Spend your time walking the trails around the hotel, sitting on the deck with a drink and watching Old Faithful or listening to the violinist in the lobby as you enjoy history in action. There is so much to do here to make your experience special. Oh my gosh!! That Inn looks amazing! Now I want to go there! You should plan a trip. Lots of great places to run around the hotel. Very cool experience! Have a great time! Nothing like a good US road trip!